Petswelcome.com / Articles / What’s The Most Pet-Friendly Place You’ve Ever Stayed In? 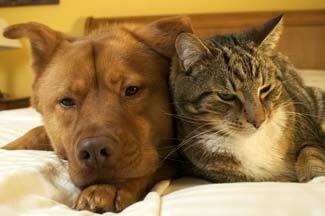 What’s The Most Pet-Friendly Place You’ve Ever Stayed In? We love our pets. We love your pets too! We want to know as you head off on adventures with your favorites furry buddy or winged companion, in what accommodation did you receive the best service and most importantly, how was your pet treated? We are asking for feedback from PetsWelcome readers about the most pet-friendly places you’ve stayed. Please vote in our Facebook poll, and add a place if it isn’t on the list. It only takes a minute and your vote contributes to helping everyone figure out where they may stay on their next road trip. And hey, if you’re not already a fan of PetsWelcome on Facebook, why not join us there, too? We share tidbits about pet travel (and some pretty adorable animal photos) there that don’t make it onto the blog. We’d love to see you there! Absolutely the BEST pet friendly hotel is the Residence Inn in Hazelton PA right off the interstate. It was so clean and we weren’t put in the lower level pet section of “just animals”. We were on the 3 rd floor in the nicest room I’d ever stayed in with my dog! Everything seemed brand spanking new! I would have paid three times the price to stay there! Highly recommend it! Thanks for the comment, Barb! Did you add it to our poll on Facebook?